Plumb Trees provides effective care for your trees and also offers unbeatable and reliable tree pruning services in Sydney. We have total 20 years of experience in the tree care industry, so you can ensure that your job is kept done in the right hands. We are the team of tree care specialists and are perfectly trained in providing the services like trimming, removing and maintaining the growth of all types of trees. Our team visits your place or your personal property and then resolve all your tree concerns. No matter what it was, we strives to give our best services to our customer and fulfill all their needs. As your garden grows, tree pruning becomes necessary and thinning out trees make trees grow healthily and safely. Hire us for Tree care services in Sydney and make your tree grow healthy. Plumb Trees has experienced professionals who are capable in safely remove tree branches and roots to make sure that the trees are free from pest. We remove decaying parts of the tree and provide best solutions to get rid of any obtrusive growth and the problems damaging the tree functioning. We offer supreme services by using the latest equipment to give the best result to our customers at affordable prices and our team strives hard to help the plant to live long and ensure tree bares flowers and fruits. We also provide the Arborists service in Sydney, we have 20 years of experience in offering the tree care services to our clients.We use the safest and the best chemicals to ensure a healthy environment and we never perform pruning to that extent which causes damage to the plant life. Our service helps in natural growth of a tree. As we value for your money, offers ultimate care in managing the plant size and remove the unhealthy and unwanted tree parts for the growth and Safety of it. Pruning a tree is very important and as a part of that , we remove the overhanging branches which causes damage to the tree and also inconvenient to the people around. We provide on time tree care services including assessment and quotes. 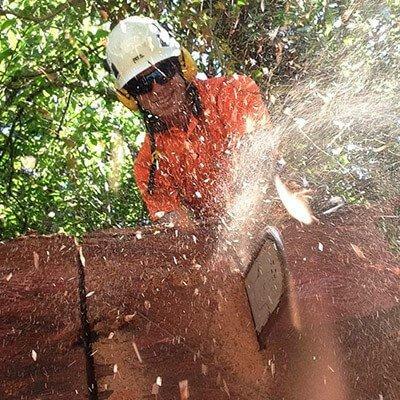 Plumb Trees provide a complete tree care service in Sydney including dead wood removal, removal of overhanging or dangerous branches. A quality pruning enhances the canopy to allow more sunlight enter into your lawn or garden. Our professionals can even prunes the palms and tries to enhance the look of untidy palms by removing seed pods and dead fronds. When you hire our team for tree pruning in Sydney, you can ensure that your outdoor area will be looking neat and clean.If need we can also provide our tree lopping and tree trimming services for your trees.